A little bit ago I won a copy of Melissa Morgan-Oakes newest book, Teach Yourself Visually: Circular Knitting, and was cheeky enough to ask if I could be a part of her blog tour and post an interview. She agreed! Look for a review in a day or two — short version, it’s fantastic, and a must if you don’t yet knit in the round! Stephannie: Since you’re one of the doyennes of knitting in the round….when would you choose, for design purposes, not to knit a pullover in the round? Or do you think it’s always workable? Melissa: Thanks so much for having me here on your blog! That is a great question. I can’t think of a time when I would not knit a pullover in the round. The only consideration might be the stability that seams provide, but that stability can be created with false seaming techniques. I will usually go to great lengths to knit things in the round whenever possible! Do you consider yourself primarily a designer, or teacher, or both equally? I think I would say both equally. I love teaching, but I love dreaming things up as well. Although a lot of what I design never sees the light of day, because I don’t love pattern writing nearly as much as I love designing. I find that teaching and designing satisfy different parts of my brain. Is another book in the works? Any design plans for the next year you can discuss? Right now there is no book in the works. I have some vague ideas, but no real focus for the time being. The first three books came very quickly, and I am looking forward to a little bit of a break now. I want to design single garments, knit some things for myself, and really just step away from the pressure that comes with a book contract. Who knows – maybe my little break will end up a book? For now I am just taking things very slowly and not committing myself to much. How do you utilize the internet and social media as a designer? Ahh, the internet! I try to use both Twitter and Facebook to let people know when a new design or book or class are on their way. I also post things at Ravelry. I am on LinkedIn. A fair amount of the social networking stuff is, I will admit, over my head. I don’t think I do it right at all! But I am trying to learn – this blog tour is an example of that. Knowing that I need to be closer to home right now has helped me to learn more about using the internet to share information. Do you have a formal business plan? Does it incorporate design goals & plans as well? I plan nothing! I know that sounds crazy to many, but nothing in my life is ever planned. I have enough trouble committing to a vacation in December six months out. I joke that I can only handle one commitment in my life at a time, and since I am married, that pretty much takes care of that. It’s meant to be humorous, but really it’s true. I do my best work and am at my happiest when I have no constraints on me and can just free associate. What’s your favorite thing about designing? Least favorite? 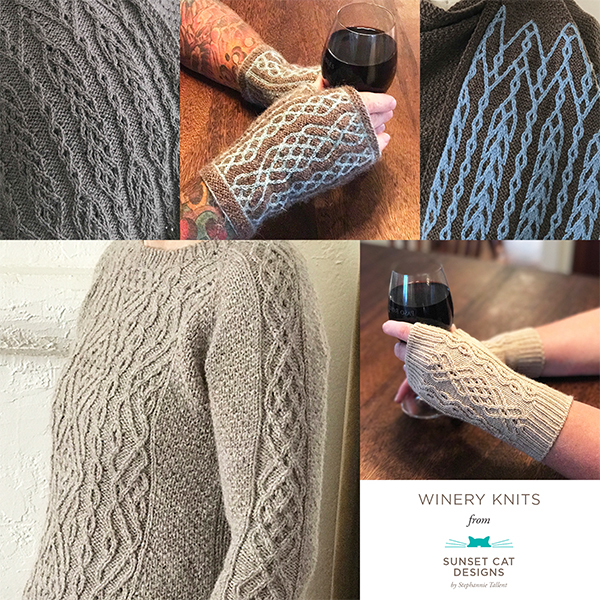 I’m including all things ancillary to actual designing & knitting – so feel free to address pattern layout, marketing, website design, etc, etc. I love the process of coming up with a sketch, a swatch, and even a garment. I love writing schematics and figuring out how big I want a garment to be in various sizes. I have very little patience for sizing things up in the actual pattern itself. In my dream I would have a staff, and I would just draw pretty things, make notes and schematics and one garment, and then hand the whole thing off to someone else for the finishing touches – like writing the pattern in the other sizes! Do you have a space set aside for working on your designs (or, lucky you if you do, a studio)? If yes, can you describe it? What would your perfect studio look (smell, feel) like? How do you balance work/life/farm chores? I try to set a schedule, but I am flexible within it. My workday runs parallel to my husband’s, which ensures the evenings are more or less free. I might knit on a project in the evening, but I am not actively designing after 6pm. Chores are done pretty consistently at set times of the day. It used to be that this was a once a day activity, but with baby layers and baby broilers around it’s at least twice a day. I gather eggs more often than that, but at least twice a day I have what could be considered real chores – water, feed and cleaning. I fit knitting, designing, and errands around that. The farm has to come first. Yarn is wonderful, but it doesn’t need to be fed! Chickens have no thumbs, so their needs are the priority. I am very careful to make time for “life”, whether it’s Gene and I enjoying a meal on the deck, or a concert, or a quiet evening in watching something on Netflix or DVD’s. it is nice, now that the nest is empty, to get time to be alone, just the two of us. We blended our family, so we never had that “alone” time that newlyweds get. You’ve said on your blog you hate winter — where would you like to live? Gene once figured out that the only place on earth I could really be happy is the Cayman Islands. Apparently the climate is very stable, although maybe a little warm for me. But if it means no snow, and no temperatures over 90, I think I could learn to live with it! For eating or sleeping on? His favorite knitted item is made with Valley Yarns Berkshire – a felted crate mat that he loves to sleep on or shake the dickens out of. His favorite consumed/murdered yarn was Artyarns Cashmere Glitter, which I try not to think about. But his real favorite yarn is Valley Yarns Charlemont that was hand dyed by Gail Callahan to match his lovely plush fur! Would you like to win a SIGNED copy of Melissa’s new book? Comment on this post by midnight PST July 9th 2011 — just say something about knitting in the round. Anything at all. US shipping only, sorry (but if you’re not in the US, but have someone to whom it can be shipped, that’s an option!). Please leave a way to reach you (email or Ravelry name). I’ll contact the winner July 8th (oops) 10th 2011. Previous post: San Luis Obispo trip!